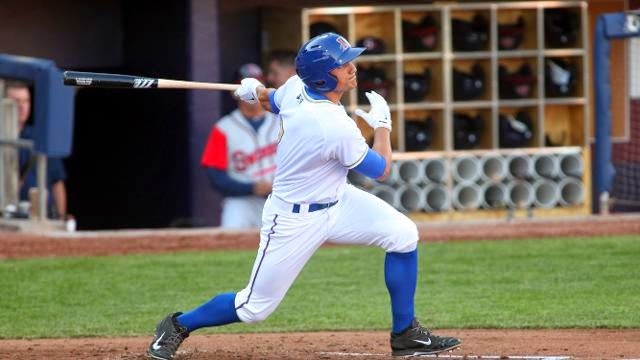 Outfielder Mikie Mahtook was headed to Florida Tuesday to see a specialist after he was hit by a pitch in the face on Monday. The doctor will determine if he could play with a protective helmet of if he will be out for up to four weeks. … C.J. Riefenhauser went on the DL with an oblique sprain. Outfielder Kevin Kiermaier (hamstring) is hoping to return Thursday after missing the past four games. Again, thanks Harold. Nice to have someone looking out for the fan’s interests. This was a really interesting game. If you weren’t able to make it there, too bad. Yes, the weather was ugly and the kids were loud, really loud, but the baseball was thrilling. Infielders Robby Price, playing in the outfield for the first time in many years and Ray Olmedo, playing 2B had some key hits, Olmedo’s triple in the 2nd inning got the scoring started and his beautiful safety squeeze bunt in the 8th scored a critical game-winning run in the 8th. Price’s single in the 8th set it up. And then there was Mike Fontenot in the unusual role of designated hitter to simply would not let Rail Rider pitching off the hook. He had two singles and an RBI double on the night. What may have been the key to winning the game, however, were the two hitters who started off the 8th inning. Rail Rider Chase Whitney had been on the mound since the 4th inning. Justin Christian took him to a full count before striking out and then Vince Belnome chipped his way through a 10+ pitch at bat before hitting a double to right field. That opened the door for the Bulls. Jerry Sands got a walk. Mike Fontenot doubled, scoring a run. Robby Price’s single brought in the go ahead run. Olmedo’s bunt brought in the insurance run the Bulls would need. Kirby Yates (ERA 0.00, 8 saves) came on to close in a 6-4 game. I packed up my stuff and bragged about Yates to the fans around me. Never a good idea. The first batter tripled then came home on an infield ground out. The next batter struck out, but it took 9 pitches to close the deal. After two strikes on the next batter, Yates threw eight straight balls, putting runners on first and second. Time for a mound visit by Neil Allen. Ball, strike, ball, strike, strike, game over. But it was a bit more thrilling that I wished. Yates’ ERA ballooned up to 0.69. The Rail Riders are a better team than their record shows. If their pitching comes around they could be contenders. Today is the first day off for the Bulls this season. Take a break guys. How Long? Oh, How Long Will That Baseball Game Go On? On a game like this one someone who writes about baseball may be forgiven if he (or she) tries to find some deep significance in a long (almost five hours), miserable (damp, breezy, mid-50’s) night. Is there something to be discerned among the seven pitchers? Some quirky moment to help make the game come to life for the 5 or 10 folks who were still there at midnight? Not much. So here’s a few small highlights and then we need to get ready for this morning’s 11:00 game. A very scary moment in the 10th when Mikie Mahtook took a pitch right in the face. By that time I was watching on MiLB-TV and got several re-runs, none of them clear. At at guess the pitch ricochetted off the inside of his helmet's brim into his cheekbone. Given the laudable new protocols in place regarding concussions, I’d guess we won’t see him on the field for a couple of days. However, he did look alert on his way off the field. After our praise yesterday, Jerry Sands had a rough night with 4 Ks. But his leadoff single in the 12th was the one of the few opportunities the Bulls had to win the game. Wilson Betemit's game-tying home run in the 9th was a beauty. We remain unimpressed with Nate Karns. Is he really ready for AAA? My guess is that he’s going to be this year’s hole in the rotation and we’ll have the chance to watch him develop (or not). His first couple of innings were OK, then he had an all too typical big inning in the 4th, 4 runs on 4 hits and 3 walks (none of the walks scored, to his credit. In addition, the RailRiders got three stolen bases off of him. C.J. Riefenhauser was put on the disabled list yesterday and I heard no explanation. As is typical with the Rays, if they don’t have to say anything, they won’t. But if anyone did hear something, please speak up. In his place, infielder Robby Price, in “extended Spring Training,” magically appeared on the bench. Then even more magically came into the game as a pitcher in the bottom of the 13th after the Rail Runners had picked up their winning runs off of Gelz. He faced one batter and will now be forever on the books as a Durham Bulls pitcher. He could very possibly be the first ballplayer ever to win two WDBB Moonlight Graham awards — one as a hitter (2012) and one as a pitcher. An interesting game, but let’s lead off with the quirky stuff (with thanks to broadcaster Kinas for mentioning it). Last Sunday, April 20th, reliever C.J. Riefenhauser was wearing a Tampa Bay Rays uniform. In the 12th inning of a game against the New York Yankees he was called in for just his second appearance as a major leaguer with a runner on first and no outs. A little bit later there are runners on first and third with two outs and he was instructed to walk the batter (Jacoby Ellsbury) in order to get to left-handed, weak hitting shortstop Dean Anna. Riefenhauser walked Anna on a disputed call at 3-2 and the run that came in turned to be the winning run. Rays manager Joe Maddon had lots to say about the call(s). Fast forward to last night, top of the 8th inning, the Bulls have just gone ahead 5-4. Mr. Riefenhauser, now wearing a Durham Bulls uniform, is on the mound and the leadoff batter is … shortstop Dean Anna, now wearing a RailRiders uniform. Anna pops up to 3B Cole Figueroa, the next two batters line out to left field, the Bulls score an insurance run in the bottom of the inning, Kirby Yates does his thing, and C.J. Riefenhauser has his first win of the year. Gotta love Triple A baseball. Now, what about the rest of the game? Merrill Kelly gave up two home runs and Bulls pitchers hit a season high number of opposing batters (3), and yet Jerry Sands and company kept the runs coming across until Sands’ last hit, a single in the 8th created an insurmountable lead. If that’s a clue regarding how much we are coming to admire Mr. Sands, it should be. He is having a career year with the Bulls. The fact that he is a local lad (Clayton) and out of Catawba College in Salisbury just adds to his stature. His swing has been a beauty to watch, but last night what was most impressive was his bat handling. Of course there was the home run in the 2nd inning. But what about the two opposite field RBIs: A sacrifice fly in the 5th and a single in the 8th? Now that was professional hitting. Last night was the first time I’ve been able to watch Hak-Ju Lee on the field since his return. He made several nice plays, including participating in a twisting 1-6-3 double play. At bat he has a long way to go, but he did draw a couple of walks. Yet another oddity of last night was seeing Ray Olmedo out in left field. It’s not that he doesn’t have any experience there. But it’s been a while, 2 games in 2012 and another few games in 2010 (this is a guy who has 1425 professional minor league games under his belt). Kevin Kiermaier is reportedly day-to-day with a hamstring concern and I’m guessing it was Mikie Mahtook’s time to have a day off. Check out the new item at the Bulls history link. The Durham Bulls have actually played 21 games, but the player with the most game appearances, Jerry Sands, has just 20, so we are close. All sorts of caveats apply to these numbers because it really is very, very early in the season. Last year’s healthy batters had between 400 and 500 plate appearances. As you can see, that implies that for these players they are at less than 15% of what we can expect to see over the season. Oddly enough, the Bulls are 14½% through the season. Or maybe not so oddly. The players marked with an asterisk (*) are on the Rays 40-man roster. That means that they can be called up to the Rays without too much roster turmoil. Only two of the Bulls position players are on the 40-man and one (Vince Belnome) is off to a slow start. Hak-Ju Lee is also on the 40-man, but he hasn’t had enough plate appearances to make the chart. This table is sorted by wOBA, my favorite batting stat. Weighted On-Base Average combines all the different aspects of hitting into one metric, weighting each of them in proportion to their actual run value. 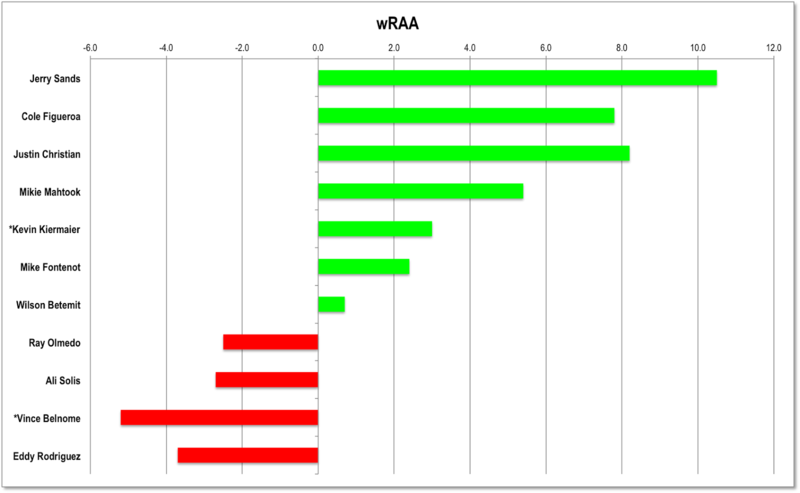 Again, this is very early in the year, but you have to love what all the guys in the positive wRAA range are doing for the team and also note the defensive contributions of almost all in the negative range. A glance at last year’s stats simply emphasizes our concerns for Vince Belnome. Nevertheless, the sample size is way too small to do anything other than say, “Well, that’s interesting.” ... and it is. One of the great pleasures of the early part of the 2013 season was watching a young shortstop, Hak-Ju Lee. But almost exactly a year ago we were writing about what turned out to be a season-ending injury. According to yesterday's transaction report, he is back with the team. We could not be happier. That’s terrific news for Lee and for the Bulls. He was not in last night’s lineup, but today … we'll see. I'll update this post as soon as I see the lineup. The downside of his arrival (and the return of C.J. Riefenhauser) is that catcher Mayo Acosta and infielder Robby Price had to come off the roster. It’s not entirely clear where they’ve gone. My guess is that Acosta is still around, but that Price may end up in Montgomery. But it’s just guesswork on my part. This was the first road loss of the year for the Bulls. Young Enny Romero went a little too long (102 pitches, the most of any Bulls pitcher this year). Pretty nice visit over in Norfolk. Three wins, two in extra innings, plus their second shutout of the season. That says a lot about Bulls pitching and overall aggressiveness. This is a very good team. In this game, the new guy, Doug Mathis, made his second appearance as a Bull in the 9th inning, and got the win. He has not yet pitched at the DBAP. [Oops! Yes he has. Back on April 16th. Not a good day for Bulls' pitching, but not all his fault. Thanks to Chris D for the correction. Also note that there was a problem in the line score of that game that has been corrected.] The near goat of the day was Adam Liberatore who may end up being a poster boy for the stats geeks. His FIP is a stunning 0.98 while his ERA is an awful 5.19. FIP, Fielding Independent Percentage, is supposedly predictive of ERA in the long run. We’ll see. Kirby Yates got his 7th save, best in the International League. You have to like everything about Justin Christian this year. Yesterday, as leadoff batter he got 4 hits (including three doubles), and scored half of the Bulls runs. He plays a mean outfield and is a smart baserunner. Meanwhile I’m worried about Vince Belnome. I know that he will break out of it eventually, but it’s just painful to watch/listen to. It will come, but his all-to-brief visit to the Rays this year seems to have broken something. 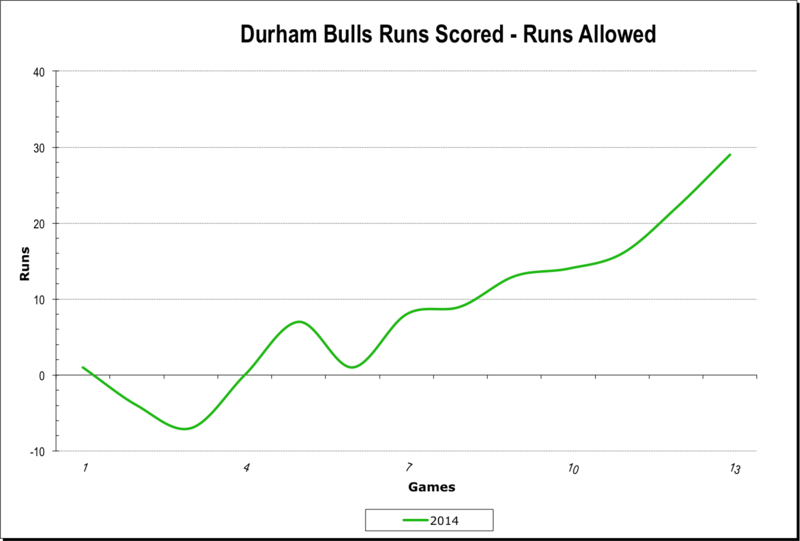 The Bulls drove by Durham on the way to Charlotte yesterday. Wonder if they even got to wave hello. The Bulls have already gone up against the Knights 6 times this year and are 5-1. Meanwhile the Knights aren’t doing much better against anyone else in the South Division. The White Sox affiliate is off to an awful start with the worst batting average in the league and near worst pitching. It’s got to turn around eventually. Just not any time soon, let’s hope. Juan Carlos Oviedo has finished his rehab and gone to St. Petersburg. C.J. Riefenhauser is back. Maddon had nice things to say about the Bulls relief crew. For the first time since the season opened, the playing field, which really wasn't quite ready, has been given a rest. Looks much better. 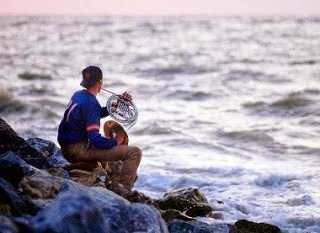 The Virginia-Pilot’s lead for their game story implies that local folks aren’t too happy with this year’s Tides team. If it’s possible for nine innings to epitomize more than two weeks of slovenly baseball, it happened Friday at Harbor Park. On the other hand, MiLB has a nice story focusing on Bulls starter Nathan Karns who got the win in the Bulls second shutout of the season. This was this year’s first extra-inning game and the team of Kevin Kiermaier and Mikie Mahtook created the win. Those two guys played together all of last year in Montgomery and after Kiermaier stole second and third base in the 11th, Mahtook brought him home. They make a terrific team. The Herald-Sun link above does a nice job of putting Matt Adriese’s nice 7 inning start in perspective. 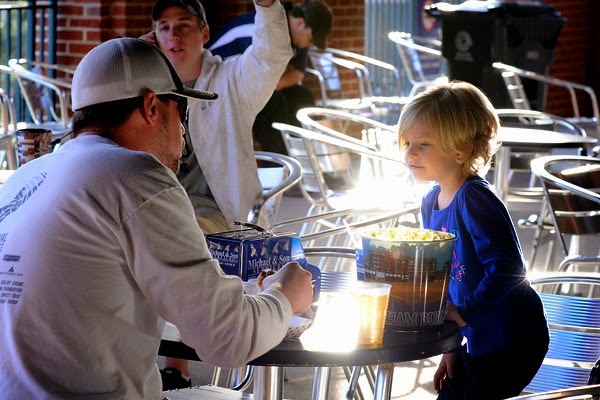 See DNA of Sports for a terrific backgrounder on outfielder Justin Christian and the home run he hit to his wife and child watching a game from Tobacco Road the other day. Relievers C.J. Riefenhauser and Brad Boxberger swapped places yesterday, with Riefenhauser being called up and Boxberger on his way back to the Bulls. A little bit of teasing over at Rays Index regarding the length of Riefenhauser’s name. He got in 1⅓ innings in last night’s slaughter of the Yankees, 2 Ks, no runs. The Tampa Bay Times has a nice story, as does Roger Mooney at the Tampa Tribune. Stacy Long is changing how he reports on the Biscuits and the Rays system over at the Montgomery Advertiser. I’ll be changing my link to his work. I think I heard broadcaster Kinas speculate that Saturday's appearance might be the last for rehabbing Juan Carlos Oviedo. Similar ideas show up in the Tampa Bay Times story linked to above. Merrill Kelly was a big deal for the Durham Bulls last year. He’s back in town and keeping the Bulls on track this year. He’s only had four appearances, two in relief and two starts. 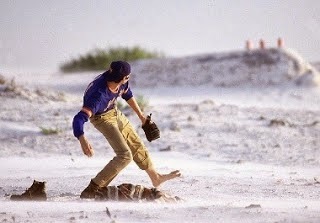 But he nevertheless has the most innings (18), most wins (3), and a very nice 1.50 ERA. Last night he got only slightly off track in the second inning when a walk, single, and a double put two runs across. Otherwise, he was untouched for the rest of the game. Those two hits were the only hits of the game for the Tides. And then there’s the rehabbing major leaguer, Juan Carlos Oviedo, who got in his inning last night. Oviedo is on his way back from surgery and a stellar career as a closer. Mostly, we here at WDBB are not big fans of the Bulls' role as a place for rehabbing ball players to work on their ouchies. More often than not their constraints mean that the Bulls have to work around them and they don’t really help the team win ball games. Oviedo seems to be an exception. Apparently he’s on a “one-and-done” rule. He’s made six appearances in relief, each for one inning. His very first time out he got touched up for 3 hits and two runs and threw 14 pitches. Those were the last runs scored on him and he’s only given up 1 hit in the last 5 games. His WHIP is a stellar 0.67 and his “efficiency”/pitches per out is an equally stellar 4.28. He doesn’t count against the Bulls 25 man limit, so in his case, it’s a win-win for everyone. Lastly, Kirby Yates had a two-inning save. He did let two guys get on base — a rarity. But his 5 saves and ERA of 0.00 are the best in the International League. You just know he’s going to get some time with the Rays this year. Sometimes we’ve participated in that great debate regarding shortstops — do you want a strong arm or a quick release? Last night Ray Olmedo made his case for the quick release faction. My notes show three very smooth plays where the ball seemed to barely touch his glove before it was on its way to 1B. You don’t see a clothesline throw from Mr. Olmedo and he often throws sidearm. But it does not seem to matter. He is so often positioned just where he needs to be and the transfer is so smooth that he gets the out anyhow. Fun to watch the veteran at work. Lastly, kudos to Jerry Sands for his 1st inning 2 RBI shot to right field and to Mike Fontenot for his very hard hit grounder that just ate up Norfolk’s 2B and brought the winning run home. Chris Gimenez, a catcher we liked to watch last year, appears to have found a home with the Round Rock Express, the AAA, Pacific Coast League, team of the Texas Rangers. There was a moment when he might have come back into the Rays system. Guess not. 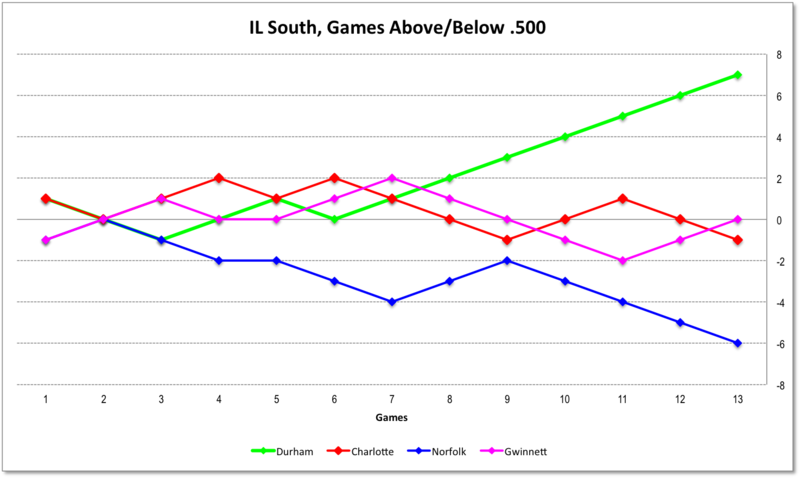 The Bulls have four games in Norfolk then drive past Durham to go to Charlotte for four games. One of the IL schedule quirks for this year. Regular readers of WDBB know that I try to make pictures of how the team is doing. The Bulls are back in town tonight and it seems to me that it’s time to put up our first set of team charts. Larger views of the charts can be obtained by clicking on them. I like the way that tracking games above/below.500 gives you a sense of how team performance is trending over time. After all, in the end a championship is decided by how many wins you have. The Bulls have ripped off an early streak of 7 games in a row and go into tonight’s game 3½ games ahead of Gwinnett in the IL South. This chart will get more meaningful over time. It is a display of the game to game net of the runs scored minus the runs allowed. The intent is to provide a visual supplement to what called “Pythagorean Expectation” or PE. PE is the spooky observation that if you take runs scored minus runs allowed and run them through an equation, you can come up with a “expected” run-loss for the team. The Bulls current PE is 9-4 whereas their actual is 10-3. That is, the team is doing slightly better than the PE would project. We will have to see. In general, the variance of actual vs expected is attributed to relief pitching. Which leads us to our next chart, Bulls pitching. This is the cumulative ERA for the Bulls over the last ten games. As can be seen, the relievers are doing better than the starters, but both are doing very, very well. They are the best in the IL as a matter of fact. 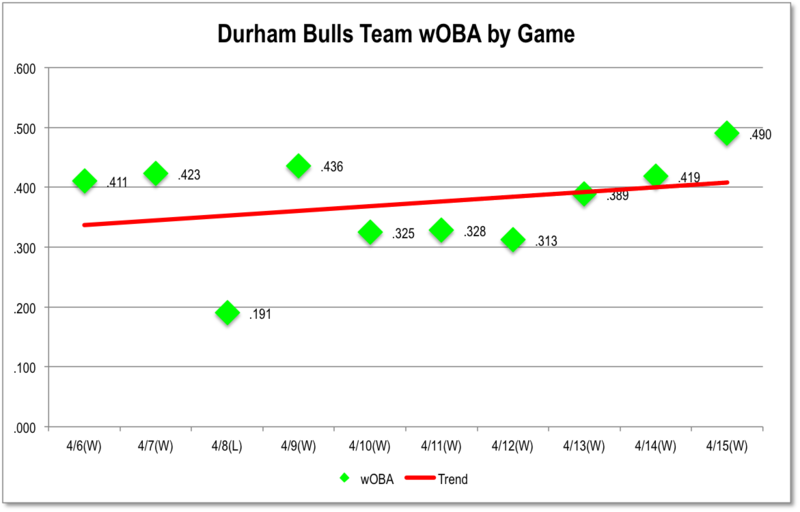 For this chart we have simply figured out the weighted On Base Average (wOBA) for the entire team for each game, then displayed the last 10 games. We prefer wOBA over any other hitting stat even if it isn’t all that well known. Think of it as a mashup of on-base percentage and slugging with a slightly more sophisticated weighting of extra base hits than OPS and adding in base running. Six in a row is a big deal. This team is looking good. Adversity and roster turmoil does not seem to be taking a toll on them … yet. The Knights management took a page out of the Bulls book and moved the game up 30 minutes to try to escape a rainout. It worked. But the Bulls ripped off four runs in the first inning and that was enough. 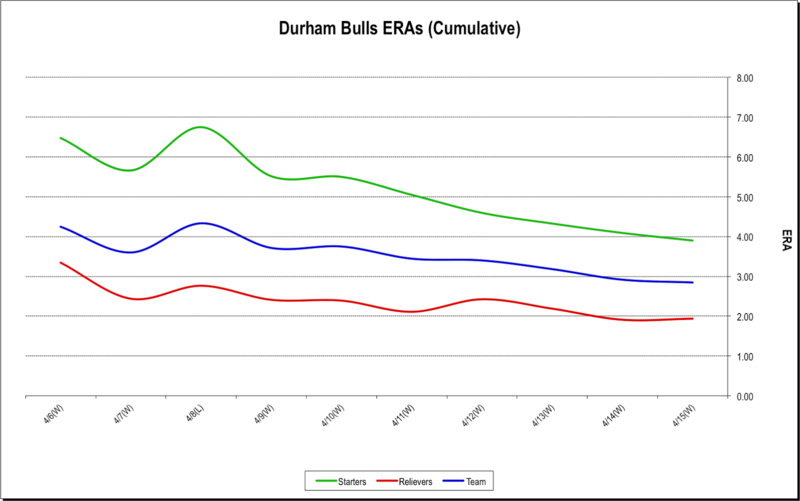 Those early runs made a huge difference since the Bulls were short yet another pitcher when young Enny Romero was scratched, apparently just in case he would be needed by the Rays. See Outside the Game below for more. Juan Sandoval showed his maturity with a solid three innings. Rehabbing Juan Carlos Oviedo made a bid for trivia immortality with a 7-pitch, 1-inning win. I say made a bid, because I’m not going to look it up. It might have been a good moment for Brad Boxberger to come in, but wait, he was in Baltimore with the Rays where he had a crisp 1 inning, 10 pitch, 1K appearance. 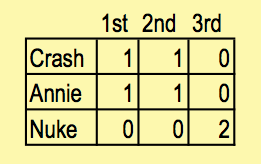 Steve Gelz did three innings, and Adam Liberatore and Kirby Yates wrapped it up. The Bulls got their first shutout of the year. On the road. That’s very, very nice. Meanwhile, Mikie Mahtook played left field in the Knights’ new park, batted 6th and had himself a terrific 5 for 5 night. Is Vince Belnome getting his eye back? Maybe. He got his first home run last night. 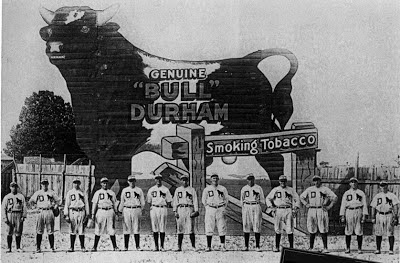 These last several days we Bulls fans have had any number of reminders that the Durham Bulls have limited control over their roster. When the mother ship comes under fire and starts taking on water, some folks get sent to the lifeboats and others are summoned from steerage to the bridge to keep her from foundering. Former Bull Matt Moore is out for at least a year. That means that Erik Bedard’s 4 innings back on April 6 could be his only appearance in a Bulls uniform, ever. Former Bull Alex Cobb has strained an oblique. We don’t quite know what that may mean to the Bulls. At a minimum that was part of the carousel that Jeff Beliveau and Brad Boxberger have been on. Then former Bull Jake Odorizzi, scheduled to pitch today in Baltimore, was reported to be under the weather, so Enny Romero was scratched from his start last night. Merrill Kelly did just fine in his first start for 2013. In fact, he went a full six innings. Kelly doesn’t strike ‘em out, he just gets them out. His only mistake was a home run to (who else?) Ernesto Mejia. As pointed out in the matchup a couple of days ago, G’Braves pitching is not up to their usual standards. The Bulls are taking advantage of that early in the season. Kevin Kiermaier got his first major league start and got famous. Check out the video and the commentary over on Rays Index. He is expected to return to the Bulls in the next day or so. Update: More on Kiermaier here. A triple is an unusual hit in baseball. Three in a game is very unusual. Last night’s first, by Mikie Mahtook, drove in Jerry Sands. The second, by catcher Roman Ali Solis, put him on 3B and he came home on a Ray Olmedo single. The third, by Justin Christian, drove in two runs and blew the game open. Christian came home on a sacrifice fly of Wilson Betemit. Meanwhile Mike Montgomery continues to look very good in a 5-inning, 5K, 1ER performance. Jeff Beliveau came back from Tampa Bay and put in a solid two innings. C.J. Riefenhauser and Kirby Yates closed it out. Kevin Kiermaier is in the starting lineup for todays game in Cincinatti. As to why, well reports have Durham Bull Erik Bedard being called up even though Cesar Ramos is listed at Tampa Bay’s starter and no corresponding roster move has been announced. Charlotte's new park opened last night. Background story here. Today is the Gwinnett Braves' home opener. So far this season they’ve had a four-game round with the Durham Bulls and finished three games over in Norfolk (one was postponed for rain). 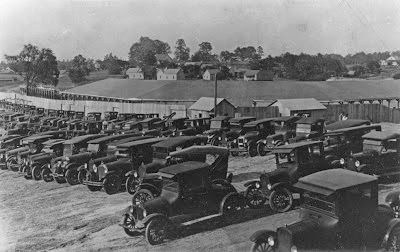 Now they are back home in Gwinnett, a town a few miles northeast of Atlanta. Rumor has it that the Atlanta Braves have built a special truck bed about 75’ long so that they can call up a relief pitcher from Gwinnett, put him and a catcher in the back of the truck, and have him warm up on the way to Atlanta. Just a rumor, of course. It is much too early in the season for these numbers to have any particular predictive value. Let’s just say that, so far, the Bulls are ½ game ahead of the Braves in the standings. They are about a match on hitting. The Braves pitching hasn’t been so good, but neither team has even gone through their rotation two times. I had the chance to chat with photographer Chris Adamczyk at Thursday morning’s game and have been browsing through her work ever since. With her kind permission, I may be putting up an image here from time to time. But you really need to go take a look for yourself. 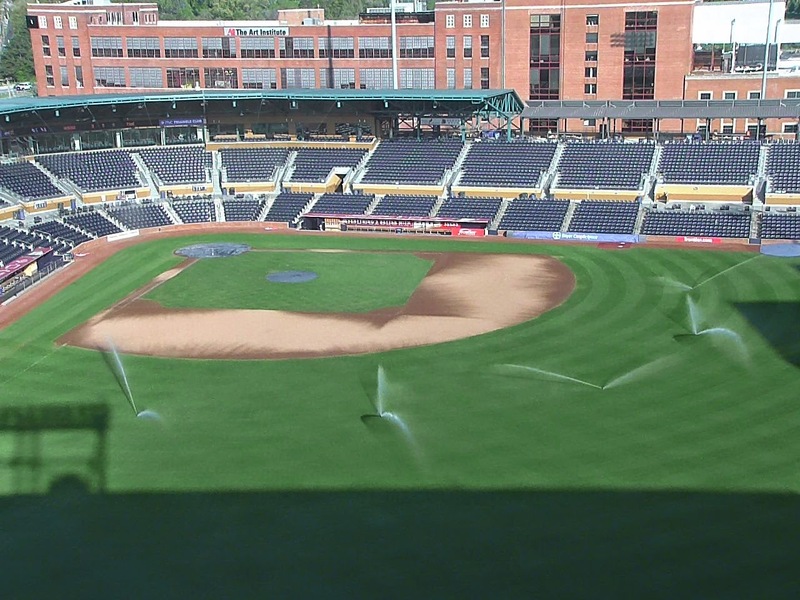 Her portfolio of the DBAP renovation here is simply amazing. And she has been and will be putting up shots from the games she attends here. I wasn’t able to get out to Tuesday’s game. The wrap and the Herald-Sun pretty much tell the tale. Good post-game interview with pitcher Enny Romero. You have to credit the Bulls marketing crew for the crowd that was there for today’s game. Reportedly they sold 7,500 tickets to the kids for an Education Day, get-away day game that was over by 2 pm. Some decent baseball as well. The Knights came out swinging. To their regret, I’d say. Bulls pitchers got 16 Ks (they are 97 on the year for an average of over 12 per game). When I asked a Bulls player at yesterday’s First Pitch luncheon who had the best arm amongst the youngsters, he mentioned Matt Andriese. Andriese collected 8 K’s and looked mostly quite good. Ray Olmedo had his first start in the leadoff spot and did his job. He got on base 3 out of 4 times, including an RBI double. 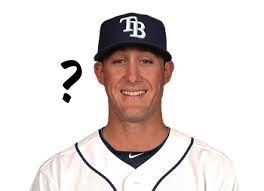 Jeff Beliveau got in a perfect inning with the Rays on Wednesday night and then was optioned back to Durham. Rays Manager Joe Maddon said that they would be looking for a left-handed hitter to fill the Matt Moore hole because the Rays are beginning a interleague game with the Cincinnati Reds. Kevin Kiermaier, who sat out today’s game was called up immediately the game and is on his way to Cincinnati. Spectacular video from opening day at the Bulls blog. Must See! From the stands we can’t really tell much about young Mr. Karns, who came to the Bulls via the trade of Jose Lobaton to the Nationals. We know that this is his first time in Triple A and, judging by the quotes in the Herald-Sun article above, Charlie thinks a lot of him. So lets just wait. Meanwhile, somewhat tongue in cheek, consider the arm of the Bulls new catcher, Roman Ali Solis. On a pickoff play he missed 1B Vince Belnome and the ball went way past the bullpen, letting the runner get to 3B. As it happened, however, the runner never made it home. More game trivia: Montoyo drew the infield in three times last night. Karns pitched his way out of the first one, but a sac fly and a double brought in a total of three runs the other two times. Left-handed reliever Jeff Beliveau went off to join the Rays in Kansas City. The reported reason is that pitcher Mike Moore is going on the disabled list for at least 15 days. Now as to why a reliever is going up when a starter gets hurt, lets just say that the Rays never go without 25 guys in the house. Beliveau’s promotion means that a guy who’s been wearing a sweatshirt all season gets to take it off and appear in a game. Catcher Mayo Acosta has actually been here all year but hasn’t been on the Bulls playing roster until yesterday. Last time we saw him was back in 2012. He had a brief appearance in the game last night. Robby Price started at 3B last night in the place of Cole Figueroa. Figueroa reported a muscle tightness after yesterday’s batting practice and was scratches. But I’d been wondering why Price’s name was familiar to me. Dug around today and finally remembered. Price was one of the winners of the 2012 WDBB Moonlight Graham award. And here he is! Good to see him in a Bulls uniform and on the field in the DBAP. Last, and most important, WDBB favorite Craig Albernaz has been located. He's playing for the Erie Sea Wolves, the Detroit Tigers AA team. Concession stand owners probably weren't happy with yesterday’s 30 minute early start. But it turns out to have been a very smart move on the part of the Bulls. Only two games were played in the IL yesterday as the weather closed out almost everyone. But someone in Durham saw a 2-3 hour window and went for it. 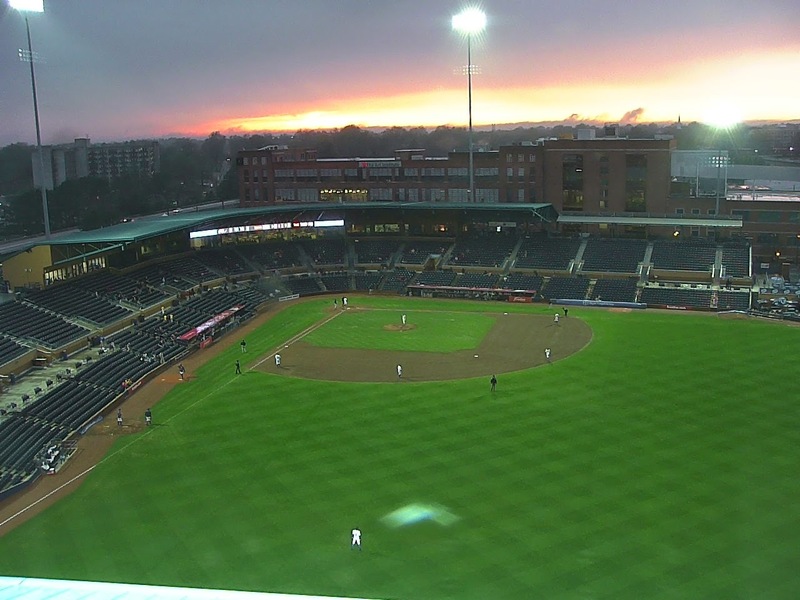 As you can see from the webcam shot not a whole lot of folks made it to the game, but the sunset sure was pretty, wasn’t it? Note the folks sitting in our seats. Official count was 1,901, but that includes season ticket holders. Doesn't look like more than a couple hundred to me. On the other hand, some folks (such as WDBB) just didn’t want to leave the house. Probably a few more compared the sitting out in the weather to watching the NCAA championship and went for that. Too bad. From listening it was an interesting game. To begin with, the first batter up, left fielder Justin Christian, banged one off the Bull and discovered he had a whole lot of friends in the clubhouse. Christian (see Herald-Sun story), it seems, just gave up tobacco and red meat so he’ll be giving away the free steak. That was followed by a Wilson Betemit single that drove in Kevin Kiermaier for enough runs to win the game. A home run by Jerry Sands and an Knights' error-plagued 8th inning added on to the score. This was the first appearance of Erik Bedard in a Bulls uniform. His 10 years of major league service time is the most on the team and he showed it with a solid 60 pitch appearance. But the guy I want to talk about today is Cole Figueroa. Is this his year? The 27 year-old infielder is off to an amazing start with a league-leading OBP (on base percentage) (Oops, original had OPS not OBP) of .722! His “slash line” is a startling .500/.722/.700; OPS 1.422. Sure it’s early in the season and he’s only had 18 plate appearances. But he is on track to do the Bulls at least as much good as he did last year and very likely much, much more. Former Bull and WDBB favorite Leslie Anderson is off to a booming start for the Yomiuri Giants of the Japan Central League: 4 for 8, 1HBP, 2 singles, 1 double, OPS - 1.556! Good for him. Another former Bull, Mike Moore, left last night’s Rays-Royals game early. He’s due for an MRI soon. 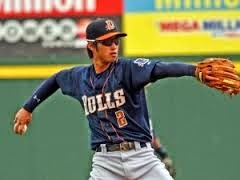 If he does need some time off, one of the current Bulls would be on the short list to join the Rays. Mike Montgomery is the most mature of Bulls starters on the 40-man. But you have to think the Rays would do some roster magic to move Bedard up instead. This post from Rays Index might seem discouraging to current Bulls. But maybe not. In the category of—how did I miss this? — we’ve learned that Justin Ruggiano is playing outfield for the Chicago Cubs. Not having a good start. Apparently hurt ankle near the end of spring training. He left some impressive numbers behind in his five year career with the Bulls. A lot to like in Sunday’s game, but let me just pick out a few items. Wilson Betemit. I have to admit that I was worried about having a 32-year old veteran with so much big league experience on the team (over 8 years with eight different clubs). He was out with an injury essentially all of last year while on the Baltimore roster. But so far, so good. The switch-hitter has started all four games (3-DH, 1-1B) and has brought a real power threat to the plate: 2 HR, 4 RBI, while drawing 5 BBs for an OPS of 1.221. Yesterday he opened the action with a 2-run homer that established a lead that held for the rest of the game. He is not on the Rays 40-man, so we can expect to see him around much of the year. Vince Belnome, last year’s star, had been quiet since his scramble down and back from St. Petersburg. Until yesterday. 2 for 4 and a RBI. Things looking up for him. I’m worried about Ray Olmedo, but probably not as much as he is. 8 Ks out of 11 AB is simply not like him at all. Surely he will come around, but I’m worried. Not so much with Mike Montgomery if he keeps this up. We were fairly critical of Montgomery’s year last season, but, according to the Herald-Sun, he’s got a new pitch he’s comfortable with. He certainly did just fine yesterday. Given what's going on outside right now, time to point out the “Coping With Rain” link over on the sidebar. I’ve done a modest update. 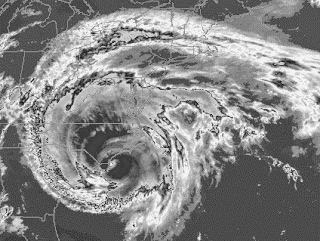 That post describes my personal strategy for dealing with a rainy day and has a nifty video about a rainy day a couple of years ago. My strategy doesn’t always work. But worth thinking about today. 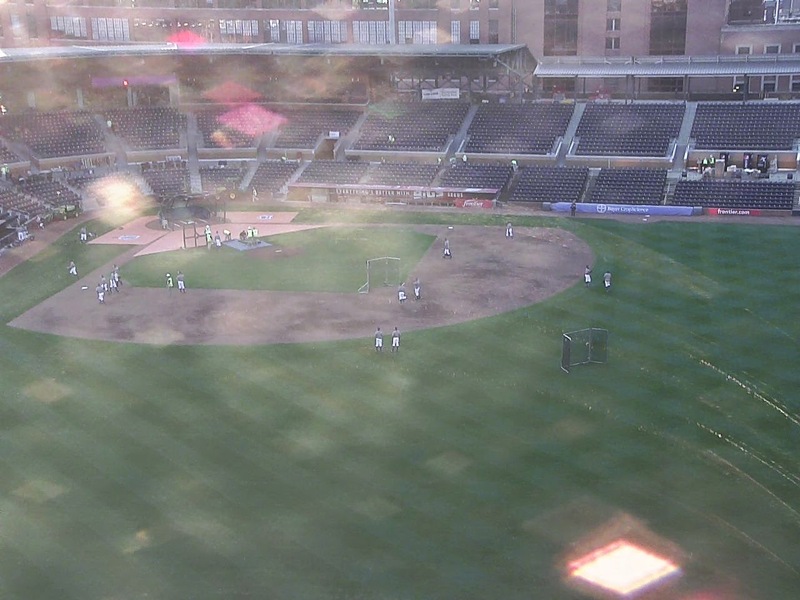 The Charlotte Knights, a White Sox affiliate, started their season over in Norfolk. They are doing well. They have four games at the DBAP before they finally have a home opener in their shiny new downtown stadium. These numbers won’t be particularly useful this early in the year, but I needed to remember how to chase them down. So here they are. Another pleasant night at the ballpark. Enjoy it folks because there will be a couple of really ugly days before we get to the summer. Far be it from me to wish a player ill—and it is very early in the season— but do I need to point out that the G’Braves Ernesto Mejia has an OPS of 2.270, 3 home runs, and 6 RBI in two games? Couldn’t he just take a day off? I know it’s early in the season, but maybe? On the Bulls side, Kevin Kiermaier is off to a very hot start. Two games, two home runs, 4 RBI and several very nice plays out in center field. He just might be the best center fielder we’ve seen in a Durham Bulls uniform. Otherwise, it was an early season game: Too many errors, too many pitches that got touched for hits. We did get to see reliever Juan Carlos Oviedo, a Rays rehab project who has been on the Rays payroll for something like a year and a half. This was officially a rehab assignment and we are likely to be seeing a bit of him before the Rays make a decision on where he fits in their scheme of things. I didn’t have anything negative to say about opening day because it was so clearly a work-in-progress. But Mike Birling, the Bulls GM has had plenty to say in an email that went out to everyone who bought a ticket. A classy apology on his part and an offer of a free ticket to any Monday-Thursday game for the rest of the year. But the offer is only on the table from April 7 to April 13. The new video and sound capabilities are very impressive. I’m expecting to see a lot of tweaks to the basic display, but I certainly appreciate the data that are out there. I didn’t notice the display up below where the press box used to be. That’s handy sometimes. I’ve got to wonder just how the radio guys are able to call pitches (location and type) from where they now sit. Terrific eyesight? Speaking of the radio, pleased to hear Scott Pose back on the air with Patrick Kinas. They make a pretty good team. About the turf: All I can say is that if you didn’t see it 10 days ago (I think I had a webcam shot of it) you have no idea how much progress has been made getting it in shape. We have it on good authority that all should be right for the next home stand. But we sure were looking forward to cup holders, those of us on the front row of the Terrace Reserved sections. Sigh. Maybe part of the next $20 million. Great to see the racers back and the Bulls are running a very clever introductory video with the racers on their way back from Spring Training. Choice of the South of the Border parking lot for some shots was inspired. Nuke still having trouble getting across the finish line. It looks like the team is ready to go. Renovations to the park appear to be complete. Parking may be a problem, so come a bit early. Don't let the weather prediction keep you from the park. 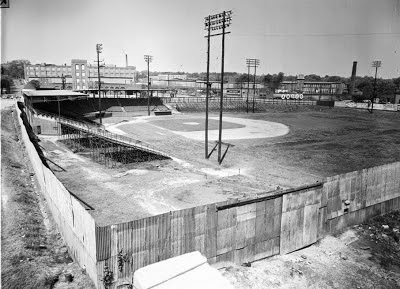 Photo credits (Top to bottom) Durham Bulls, 1913; Durham Athletic Park, 1940's; East Durham Baseball Park, 1920's; Hurricane Fran comes inland, 1996. A couple of days ago Chris D came up with his opening day lineup. But we now know (from Stacy Long) that the scheduled starting pitcher is to be Nathan Karns in what I think will be his first start at AAA. Karns came to the Bulls out of the Washington system. Long also reports the rest of the starting rotation to be Enny Romero, Matt Andriese, Mike Montgomery, and Erik Bedard. Who else wants to jump in? Here's a sight we've been waiting for — the 2014 Durham Bulls on the field. 7:00 pm April 1.